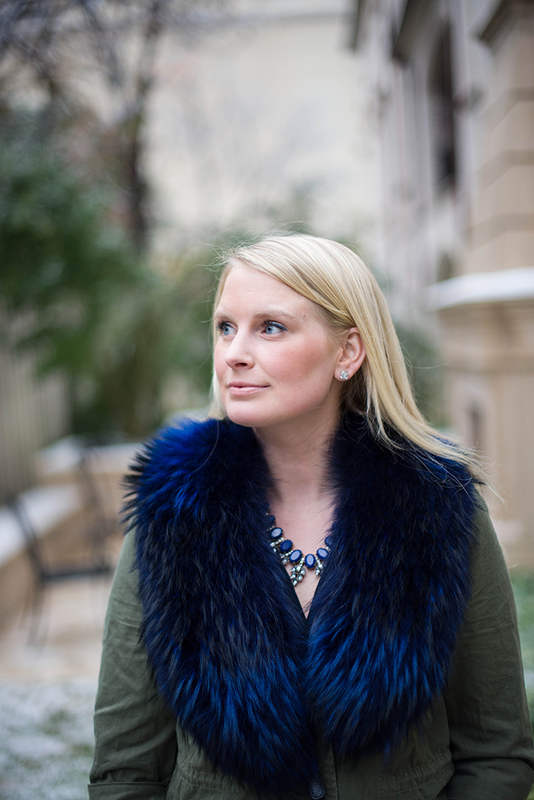 As I mentioned yesterday, this top/jacket is going to make multiple appearances throughout the year – it’s such a versatile piece! 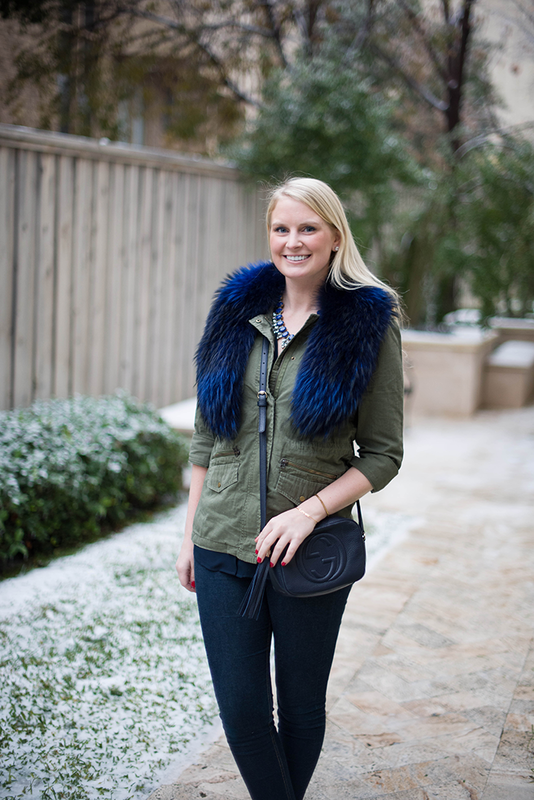 Today I threw it over my navy silk Theory blouse and topped it with my fur collar from OTTE. 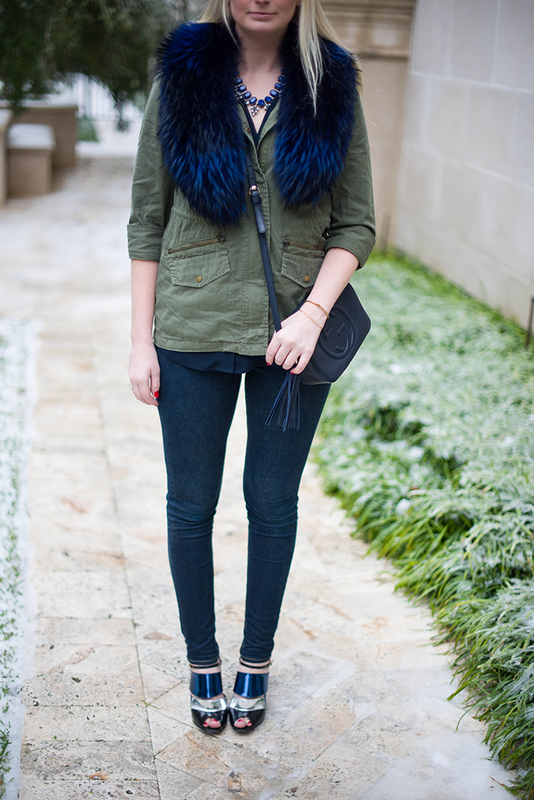 The military green in the jacket offsets all of the blue shades working in this look and dresses it down a bit. I’m also still toting around my Gucci soho disco bag. Seriously such an easy piece to wear and the perfect size for me. I don’t carry much in my purse so it’s a good size for other minimalists out there (I can’t deal with clutter). One last thing to mention is about my jeans – you’ve seen them in several other outfit posts already, and it’s because they are my favorite skinny jeans right now. They’re skinny right down to the ankle, so they look great with any shoe. Snag a pair here! This outfit is both casual and glam, LOVE the shoes! Such an unexpected mix here, but I love it! That blue collar is gorgeous!! That Otte collar is to die for!! Love the way you’ve styled it! that collar is such an amazing statemtn piece. and those shoes are not so bad, either! 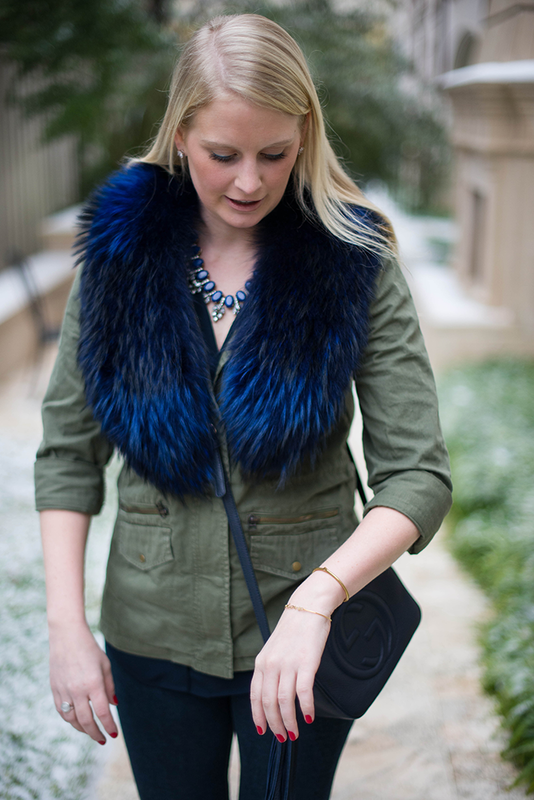 LOOVEEE that blue fur!! Beautiful Merritt! That fur is incredible. I’ve been eyeing it forever! Those heels!! Fantastic. Love that blue shade on you. I love army green with navy blue too. Your fur addition is so stylish!! I like the unexpected color combo. And I love the Fendi shoes ! I always find it difficult finding jeans that stay skinny all the way to my ankles! I either have to get them hemmed and altered or just tuck them. Case in point… I need these jeans! Fabulous!! Those shoes are gorgeous!! And I love the blue fur. 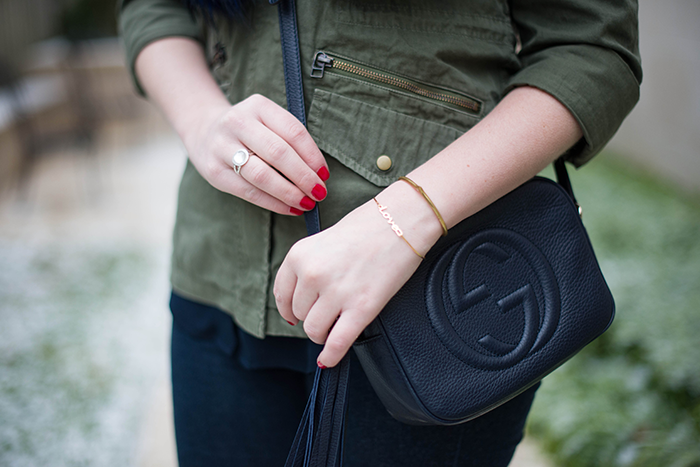 Love love this combo! Don’t think I didn’t notice the matching eyeliner;) Nice touch! I loved this and then I saw the shoes and died! Your fair skin tone looks lovely with navy, and these may be my favorite pair of shoes that you own. Love, love, love.